For other uses, see I Feel Love (disambiguation). "I Feel Love" is a song by American recording artist Donna Summer, produced by Giorgio Moroder and Pete Bellotte. It was first released on Summer's fifth studio album, I Remember Yesterday (1977). The song became popular during the disco period and is widely credited as "one of the most influential records ever made", originating electronic dance music. Moroder described Summer's work with him on the song as "really the start of electronic dance" music. In 2011, the Library of Congress added the song to the National Recording Registry as "culturally, historically, or aesthetically important". "I Feel love" peaked at number six on the Billboard Hot 100. Outside the United States, the song topped the charts in Australia, Austria, Belgium, France, Italy, the Netherlands and the United Kingdom. "Can't We Just Sit Down (And Talk It Over)"
In 1970s Munich, Musicland Studios, led by producers Giorgio Moroder and Pete Belotte, had produced a number of disco hits, including Summer's "Love To Love You Baby" (1975). Summer had moved to Munich to perform in the musical Hair, and had become a successful session vocalist. Moroder described her as "an incredibly talented singer, who could improvise but was also very disciplined". Summer's fifth album, I Remember Yesterday (1977), would be a concept album with each track evoking a different musical decade, such as 40s swing, 60s girl groups, and 70s funk and disco. For the final track, "I Feel Love", the team wanted to create a futuristic mood. Before "I Feel Love", most disco recordings were backed by orchestras. Instead, the team produced "I Feel Love" with a Moog Modular 3P synthesizer borrowed from the classical composer Eberhard Schoener, aided by Schoener's assistant, Robby Wedel. Wedel proved essential for using the technically complex synthesizer, and Moroder described him as the "unsung hero" of the project. He demonstrated how to synchronize the song's various elements using an internal click track, a feat Moroder described as "a revelation". The song was recorded on a 16-track tape recorder, with the various parts played on a sequencer. As the Moog went out of tune quickly, it had to be recorded in bursts of twenty or thirty seconds before being retuned. To create the hi-hat sound, the team took white noise generated by the Moog and processed it with an envelope. As the Moog could not create an appropriate kick drum sound, the kick was played on a drum kit by session drummer Keith Forsey. Aside from Summer's vocals, the kick drum is the only element of the song not played by a machine. Bellotte wrote the lyrics, which Summer recorded in one take. In contrast to the deeper chest voice of most disco vocals, Summer sang in head voice, which Pitchfork described as "breathy and angelic". Unusually for a disco track of that era, Moroder composed the backing track and bassline before the melody. He introduced a variety by altering the key at regular intervals and layering in Summer's vocals. "I Feel Love" is in the key of C major, with electronic dance flavor, and choruses and interludes. The album version has a length of 5:53. It was extended to 8:15 for release as a 12" maxi-single, and is included on the 1989 compilation The Dance Collection: A Compilation of Twelve Inch Singles. The song was edited to 3:45 on the 7" format, the fade-in opening sound reaching maximum volume sooner and fades out before the third verse and final choruses.This version has been included on a large number of greatest hits packages and other compilations issued by PolyGram, Mercury Records, Universal Music and others, such as 1994's Endless Summer: Greatest Hits and 2003's The Journey: The Very Best of Donna Summer. A new edit of 3:20 was released on Donna Summer's first compilation album On the Radio: Greatest Hits Volumes I & II. Following its huge commercial success, Summer, Moroder and Bellotte produced an 11-minute "Now I Need You"/"Working the Midnight Shift" sequence on Summer's 1977 double album Once Upon a Time, which successfully builds on "I Feel Love"'s pioneering ethereal vocals, mechanised beats, sequenced arpeggios and ostinato basslines. Each note of the bassline is doubled by a delay effect. The unmodified bassline plays through the left channel and the slightly delayed repetition through the right, creating a flickering, strobe-like effect. According to David Bowie, then in the middle of recording of his Berlin Trilogy with Brian Eno, its impact on the genre's direction was recognized early on; "One day in Berlin ... Eno came running in and said, "I have heard the sound of the future."... he puts on "I Feel Love," by Donna Summer ... He said, "This is it; look no further. This single is going to change the sound of club music for the next fifteen years." Which was more or less right." Music critic Vince Aletti wrote that, "The pace is fierce and utterly gripping with the synthesizer effects particularly aggressive and emotionally charged." He went on to predict that the track "should easily equal if not surpass" the success of "Love to Love You Baby" in the clubs. "I Feel Love" peaked at number six on the Billboard Hot 100 chart the week of November 12, 1977. It reached number nine on the Soul Singles Chart in October 1977. Its 1995 remix peaked at number nine on the Billboard Hot Dance Club Play. In the United Kingdom, "I Feel Love" peaked at the top of the UK Singles Chart in July 1977, a position it maintained for four weeks. The 1982 and 1995 remixes of the song peaked at number 21 and number eight on the UK Singles Chart respectively, and sales of these physical singles totalled 956,400. According to the Official Charts Company, together with digital sales, "I Feel Love" has sold 1.07 million copies in the United Kingdom as of June 2013, making it Britain's 103rd best-selling single of all time. Elsewhere, "I Feel Love" also topped the charts in Australia, Austria, Belgium, France, Italy and the Netherlands, and peaked within the top ten of the charts in Canada, Germany, New Zealand, Norway, the Republic of Ireland, South Africa, Sweden and Switzerland. Giorgio Moroder and Pete Bellotte's innovative production of this disco-style song, recorded with an entirely synthesized backing track, utilizing a Moog synthesizer, spawned imitators in the disco genre and was influential in the development of new wave, synth-pop and later techno. In a 2017 feature on the song's 40th anniversary for Pitchfork, journalist Simon Reynolds reflected that "I Feel Love" had a significant impact on music across all genres for the next decade, including rock-leaning genres such as post-punk and new wave, and subsequent sub-genres of the electronic dance music style the song had pioneered, including Hi-NRG, Italo disco, house, techno, and trance. Reynolds also posited "If any one song can be pinpointed as where the 1980s began, it's 'I Feel Love'." Whenever, however you hear this tune, it's guaranteed to make you smile, shut your eyes and trance out. The first electronic disco masterpiece, disco diva Donna and Moroder's finest, trippiest moment. Whether it's Derrick May or Carl Craig slipping Patrick Cowley's deliciously psychedelic 1982 remix into their techno sets, or Masters at Work climaxing a four deck set with last years garaged-up remake, or just some bloke in a bow tie playing the original at your brother's wedding, this record is timeless. And priceless. No longer would synthesizers remain the intellectual property of prog-classical geeks. And, separated from its LP context and taken as a Top 10 single, it didn't just suggest the future, it was the future. Cooing ascending couplets of an almost banal ecstasy, Summer's breathy vocals still dwelled in the stratosphere of her own manufactured sensation. In 2011, The Guardian's Richard Vine ranked the release of "I Feel Love" as one of 50 key events in the history of dance music, proclaiming it "one of the first to fully utilise the potential of electronics, replacing lush disco orchestration with the hypnotic precision of machines". Sometimes a song comes along that's so innovative that it changes the shape of the musical landscape for decades, whilst also getting you to shake yo bootay. This timeless, Giorgio Moroder-produced disco anthem from 1977 did exactly that, becoming the first purely electronic jam to make it big and pretty much inventing dance music in the process. The information regarding lists including "I Feel Love" is adapted from Acclaimed Music, except where otherwise noted. In 1978, disco and hi-NRG DJ Patrick Cowley created a 15:43 remix of "I Feel Love" which, despite not impressing Moroder, became a popular "underground classic" available only on acetate discs. The remix used loops, keeping the song's bass-line going for extended passages of overdubbed effects and synthesiser parts. In mid-1980, Cowley's mix was released with the title "I Feel Love / I Feel Megalove" and subtitle "The Patrick Cowley MegaMix", but only on a limited vinyl pressing by the DJ-only subscription service Disconet. Since this pressing was not available to the general public for commercial sale, it became highly sought after by collectors. In 1982, the mix was released on a commercially available 12" single in the UK market by Casablanca, backed with an 8-minute edited version. With this wider release, "I Feel Love" became a dance floor hit again, five years after its debut. A further-edited 7" single reached number 21 on the UK Singles Chart. The Patrick Cowley mix was out of print until it was released on the bonus disc of the 2003 UK edition of The Journey: The Very Best of Donna Summer and the Ben Liebrand compilation album Grand 12-Inches. It also exists on the 2013 double disc I Feel Love: The Collection. In 1985, Bronski Beat with singer Jimmy Sommerville joined up with singer Marc Almond to record a version of Summer's "I Feel Love". The full version was actually a medley that also incorporated snippets of Summer's "Love to Love You Baby" and John Leyton's "Johnny Remember Me". It was a big success, reaching third in the UK. Although the original had been one of Marc Almond's all-time favourite songs, he had never read the lyrics and thus incorrectly sang "What'll it be, what'll it be, you and me" instead of "Falling free, falling free, falling free" on the finished record. Following 1993's The Donna Summer Anthology and 1994's Endless Summer: Greatest Hits, both released by PolyGram, "I Feel Love" was re-released on the PolyGram sublabel Manifesto in a newly remixed form as a single in 1995, including mixes by Masters At Work and Rollo Armstrong and Sister Bliss of UK remixer/producer team Faithless – and also new vocals by Summer. The single became a UK number 8 hit, the second time the song had entered the Top 10, and the '95 Radio Edit was later included as a bonus track on PolyGram France's version of the Endless Summer compilation. The 1995 release also peaked at number 80 in Australia. ^ Benjamin Genocchio;"Exploring the Effects of Disco's Beat", The New York Times, February 19, 2006. ^ "Complete National Recording Registry Listing". Library of Congress. Retrieved December 3, 2017. ^ "Nominate - National Recording Preservation Board". Library of Congress. Retrieved December 3, 2017. ^ a b c d e f g h i j "I feel love: Donna Summer and Giorgio Moroder created the template for dance music as we know it". Mixmag. Retrieved 2018-10-13. ^ Jason Ankeny. "I Feel Love - Donna Summer | Song Info". AllMusic. Retrieved 2016-10-12. ^ Buskin, Richard (October 2009). "Donna Summer 'I Feel Love'". Sound on Sound. Retrieved 2017-07-26. ^ McConville, Davo (April 29, 2014). "How We Made: Giorgio Moroder on "I Feel Love"". Noisy.vice.com. Retrieved 2017-07-26. ^ a b c "Song from the Future: The Story of Donna Summer and Giorgio Moroder's | Pitchfork". pitchfork.com. Retrieved 2018-10-13. ^ "Donna Summer biography". AllMusic. Retrieved 2011-03-12. Eschewing the strings and typical disco excess, 'I Feel Love' was the first major pop hit recorded with an entirely synthesized backing track; its lean, sleek arrangement and driving, hypnotic pulse laid the groundwork not only for countless Euro-dance imitators, but also for the house music revolution of the 1980s and '90s. ^ "Donna Summer - I Feel Love (Vinyl)". Discogs.com. Retrieved 2016-10-12. ^ Lawrence (2004). Love Saves the Day. p. 253. ^ "Official Charts Analysis: UK suffers lowest album sales week since 1996". MusicWeek. May 21, 2012. Retrieved November 7, 2012. ^ Lane, Daniel (June 27, 2013). "Daft Punk's Get Lucky becomes one of the UK's biggest selling singles of all-time!". Official Charts Company. Retrieved January 2, 2014. ^ "Donna Summer I Feel Love". Pop Icons. Feb 24, 2015. Retrieved May 19, 2016. ^ a b Reynolds, Simon (June 29, 2017). "Song from the Future: The Story of Donna Summer and Giorgio Moroder's 'I Feel Love'". Pitchfork. Retrieved September 20, 2018. ^ Pemberton, Andy. "The 100 Greatest Dance Singles of All Time". ravehistory.homestead.com. Retrieved December 26, 2018. ^ "100 Greatest Dance Songs". Slant Magazine. 30 January 2006. Retrieved 26 January 2017. ^ Richard Vine (2011-06-15). "Donna Summer's I Feel Love". www.guardian.co.uk. Retrieved 2017-03-12. ^ "The 100 best party songs". Time Out. Retrieved October 4, 2018. ^ "I Feel Love". Acclaimed Music. Retrieved December 3, 2017. ^ "The 200 Best Songs of the 1970s". Pitchfork. August 22, 2016. p. 10. Retrieved December 3, 2017. ^ Kent, David (1993). Australian Chart Book 1970–1992 (Illustrated ed.). St. Ives, N.S.W. : Australian Chart Book. p. 300. ISBN 0-646-11917-6. ^ "Austriancharts.at – Donna Summer – I Feel Love" (in German). Ö3 Austria Top 40. Retrieved June 7, 2018. ^ "Ultratop.be – Donna Summer – I Feel Love" (in Dutch). Ultratop 50. Retrieved June 7, 2018. ^ "Top RPM Singles: Issue 5454a." RPM. Library and Archives Canada. Retrieved June 7, 2018. ^ "Offiziellecharts.de – Donna Summer – I Feel Love". GfK Entertainment Charts. Retrieved June 7, 2018. ^ "The Irish Charts – Search Results – I Feel Love". Irish Singles Chart. Retrieved March 6, 2016. ^ "Indice per Interprete: S". Hit Parade Italia (in Italian). Retrieved June 7, 2018. ^ "Nederlandse Top 40 – week 37, 1977" (in Dutch). Dutch Top 40 Retrieved June 7, 2018. ^ "Dutchcharts.nl – Donna Summer – I Feel Love" (in Dutch). Single Top 100. Retrieved June 7, 2018. ^ "Charts.nz – Donna Summer – I Feel Love". Top 40 Singles. Retrieved June 7, 2018. ^ "Norwegiancharts.com – Donna Summer – I Feel Love". VG-lista. Retrieved June 7, 2018. ^ "SA Charts 1965–March 1989". Retrieved 3 October 2018. ^ "Swedishcharts.com – Donna Summer – I Feel Love". Singles Top 100. Retrieved June 7, 2018. ^ "Swisscharts.com – Donna Summer – I Feel Love". Swiss Singles Chart. Retrieved June 7, 2018. ^ a b c "Official Singles Chart Top 100". Official Charts Company. Retrieved June 7, 2018. ^ "Hot R&B/Hip-Hop Songs Chart - Billboard". Billboard. October 1, 1977. Retrieved February 15, 2019. ^ Kent, David (1993). Australian Chart Book 1970–1992 (Illustrated ed.). St. Ives, N.S.W. : Australian Chart Book. p. 429. ISBN 0-646-11917-6. ^ Hunter, Nigel; Scaping, Peter, eds. (1978). "Top 100 Singles in 1977". BPI Year Book 1978 (3rd ed.). London, England: The British Phonographic Industry Ltd. pp. 216–17. ISBN 0-906154-01-4. ^ "I Feel Love release info". Discogs. Retrieved April 18, 2011. 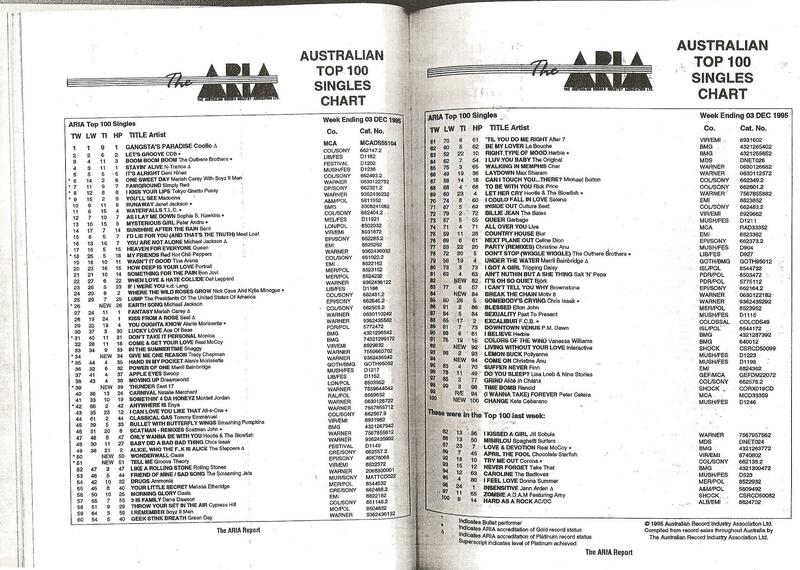 ^ "The ARIA Australian Top 100 Singles Chart – Week Ending 03 Dec 1995". Imgur.com (original document published by ARIA). Retrieved July 17, 2017. N.B. The HP column displays the highest peak reached. ^ "Eurochart Hot 100 Singles" (PDF). Music & Media. September 16, 1995. Retrieved April 9, 2018. ^ "Lescharts.com – Donna Summer – I Feel Love" (in French). Les classement single. Retrieved June 7, 2018. ^ "Official Singles Chart Top 100". Official Charts Company. Retrieved June 7, 2018. ^ "Official Dance Singles Chart Top 40". Official Charts Company. Retrieved June 7, 2018.